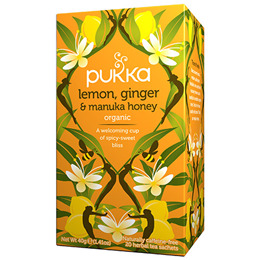 Pukka Lemon, Ginger & Manuka Honey Tea is a deeply soothing organic herbal tea. A traditional blend of zesty lemon and spicy ginger with sweet, nourishing notes of manuka honey. This tea is made from ripe, organic lemons and ginger root that have been slow-dried to capture their intense deliciousness. The oodles of fruity-spice are then blended with manuka honey to give a soothing sweet finish. Naturally caffeine free and ethically sourced, organically grown ingredients: Ginger root* (32%), licorice root, elderflower, fennel seed, lemon verbena leaf, turmeric root, lemon essential oil flavour (6%), lemon myrtle leaf, whole lemon (4%), manuka honey flavour* (2%) (*contains 0.2% non organic antioxidant: ascorbic acid). Below are reviews of Pukka Teas Organic Lemon, Ginger & Manuka Honey - 20 Teabags by bodykind customers. If you have tried this product we'd love to hear what you think so please leave a review. I have been purchasing Pukka teas for many years now and enjoy this flavor as its good for sore throats and to drink when you want to relax. Just the right balance of flavour. A good tea to start the day! It's just refreshing. Nice product. Bought as a present and she absolutely loves it! Also goes really well with the tea caddy!